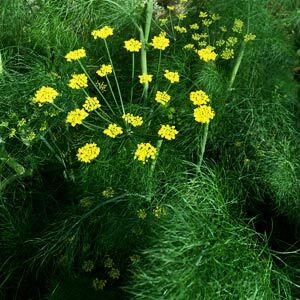 Dill is easy to grow in the home garden, and being used in small quantities in cooking, it is great to have a plant for culinary uses. Dill is used for both its seeds and its leaves. Growing and Harvesting Dill is fairly easy as long as you have a deep well drained soil. Dill should be sown from seed in spring after the danger of frosts is over. Use a tall container to allow for the long tap root, this also makes the plant look impressive in a courtyard. You can of course grow it in the vegetable garden, however remember to keep it under control. Choose a position in good morning sun and light afternoon shade for best results. Dill is fairly easy to grow given humus rich well drained soil. The trick is to have deep soil to allow for the long tap root. Used as a companion plant with cabbages, cauliflowers and related plants it seems to deter insects such as cabbage moths. This is a sun loving plant, however it will grow well in part shade, however not deep shade. It is tall growing, reaching around 1 metre (3 ft) in height in good conditions. It grows well from seeds, however seedlings are easier. Best sown directly as this is a plant that resents being repotted. Seeds are usually sown in spring and you will be ready to harvest about 6 weeks later. Remember that this is a plant that will self seed, so deadhead to prevent this. Dill is usually used fresh, so its simply a matter of picking it as you need it. Constant picking will also help prevent the plant ‘bolting’ or going to seed.